There are several very serious problems here, as we stare into the maw of the post-antibiotic era: despite the fact that the problem is widespread and growing, antibiotics are still being widely, and wantonly misused. And, economic and political interests are standing in the way of changing this. Penicillin, of course, was the first antibiotic discovered, in the 1930's. Even before it was being widely used, bacteria were developing resistance. Indeed, all antibiotics quickly lose their effectiveness, as the discoverer of penicillin, Alexander Fleming, warned in the 1940's, because they are a potent artificial selective force for resistance. That's why they should be used only when necessary. 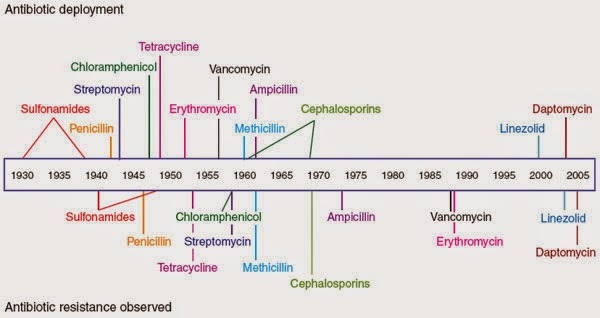 Year of first use and then clinical resistance for each antibiotic; Nature Chemical Biology, 2007; Clatworthy et al. Antibiotics are like any other environmental agent when it comes to the evolutionary dynamics of any species, including bacteria. If gene variants are present in the bacterial population that allow a subset of bugs to survive the chemical onslaught, this leads to resistance. Antibiotics and chemotherapy against tumor cells are similar in this regard -- generally not strong enough to wipe out the entire population of cells. When protective mutations are present, the overall population diminishes initially, as the majority of susceptible individuals are killed off, which leaves the field to the resistant few, which then proliferates, rendering therapy that was previously beneficial to the patient useless. The situation is usually not quick or simple, but this is the simple nature of evolutionary adaptation. Molecular attacks on cells can in principle act as selective factors that lead to resistance to the attack. There is no perfect or permanent solution, unless there is a mode of attack so fundamental to the target cells that they simply cannot evade it by modifying their own molecular makeup. Such modes would be very desirable, but are not generally part of the arsenal we have against microbes or cancer cells and the like. Instead, intervention approaches need to be used cleverly and sparingly so that resistance mutations don't have any advantage in the organism's population. Indeed, since these organisms like bacteria (or your normal body cells) are the produce of eons of adaptation, most changes will be at least slightly harmful if they do anything, and will be outcompeted into oblivion by the 'normal' competitors in the population. The problem is that this basic evolutionary truth is too often neglected. The reasons are only human, about short-sightedness, unawareness, personal vested interests, and so on. There are several ways in which antibiotics are over-used that apparently lead to the present state of the problem. Doctors and patients both are part of the problem; patients demanding treatment, even for viral infections, and doctors prescribing antibiotics just in case the infection is actually bacterial. Of course, a big villain in the piece, discussed at length in Resistance, is routine use of antibiotics in animal agriculture, to promote growth in their densely raised livestock. These are well-documented ways in which too much use leads to natural selection of resistant strains. As the film also notes, there are widely known financial reasons for under-development of antibiotics by pharmaceutical firms. There are also many technical limits, such as that many pathogens have not been growable and hence testable in the lab. Clever ways around these problems probably exist--but we must make the research fundable. There is no current known way to avoid the development of antibiotic resistance. But, eliminating its use as a growth promoter in livestock would slow down the speed at which new drugs become useless, culturing infected tissues in real time in the doctor's office so that only bacterial infections are treated with antibiotics would help, patients using them for the proper length of time would help, and so on. More research into drugs that are less likely to spawn resistance would help enormously as well. And, subsidies for drug companies who do choose to invest in what is not a highly profitable class of drugs. We need somehow to decouple research from profits so that this research will be done. But this requires recognition of the enormity of the problem and its potentially catastrophic consequences. If we take that seriously, we would divert huge amounts of funds in this research direction. Infectious diseases and their potential future pandemic effects are far more important to study than many of the things we are currently pouring money into. Of course, we think that much of research on enumerating individually trivial genetic variants related to late-onset, mainly environmentally caused diseases (the goal of the proposed 'precision' medicine) is hugely wasteful. Indeed, many who do genomic research that leads hardly anywhere have the gear and technical skills to take the antibiotic issues on with much more potential for real health gains. There's no sense in knowing a person's minor genetic risks factors for, say, adult-onset diabetes, if they're going to be eaten alive by bacteria first. That's research emperors fiddling while Rome burns. Half a century ago, a number of expeditions were taken by US, South American, and European scientists into the hinterlands of the Amazon rainforest. Most or all of the tribal groups they visited were near Catholic mission stations, where there was a lot of interaction, or people were interacting in other ways with the colonizers of the continent. 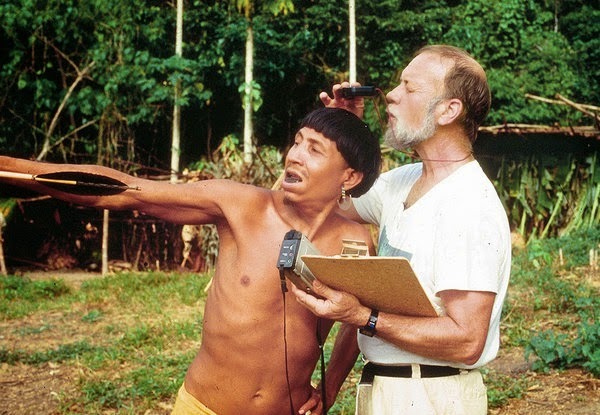 Napoleon Chagnon, then at the University of Michigan (and whom I knew as a graduate student and post-doc), with contributions from other investigators, made the Yanomami tribal group of the Amazon basin the most famous 'native' population in the world. For many years Nap was the world's most prominent cultural anthropologist, probably succeeding Margaret Mead in that distinction. Indeed, he may still be. His work was assertive, among other things driven by evolutionary theory about reproductive dominance and behavior in tribal human societies, and the aggression that went with that. He was a pro-active rather than purely observational anthropologist. This naturally raised opposition and contention, of which there has been an ample amount for decades. As well as cultural studies there were biomedical and in particular genetic studies of the many Yanomami villages. The object was to test some ideas about the amount of mutation that arose and the persistence of genetic variation in tribal groups living under their kinds of conditions. Could the Yanomami social and reproductive structure, in particular group size, fragmentation, and dominance hierarchies, tell us anything about the way genetic variation had been maintained in our ancestral populations? The interest was not purely scientific, but more specifically was about the dangers we in the developed world faced as a consequence of our exposure to mutagens. In particular, at the time, was concern over exposure to nuclear radiation from x-rays and the like, and fallout from nuclear bomb testing. Jim Neel a world-leading geneticist at the University of Michigan was the primary biomedical/genetic investigator. 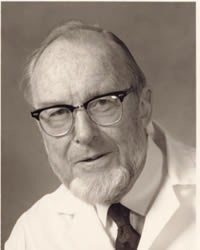 He was working on the health effects on survivors of the atomic bombs that had been dropped on Nagasaki and Hiroshima during World War II, and had a keen interest in these questions. He was also my post-doc supervisor, and when years later he retired, he asked me and a couple of other investigators to be custodian of the DNA samples, and to analyze them as new technologies made that possible. But in 2000, a book called Darkness in El Dorado by Patrick Tierney was published. Tierney accused Neel and Chagnon (and others) of grievous abuses of the Yanomami, taking harmful advantage of the tribe for their own professional advancement. We've previously written about these issues here, and beginning here. Major controversies have swirled around these accusations, and there is no need to go into them here. An available HBO film, Secrets of the Tribe, and several YouTube videos and published articles and stories can be easily found if you want to learn more. 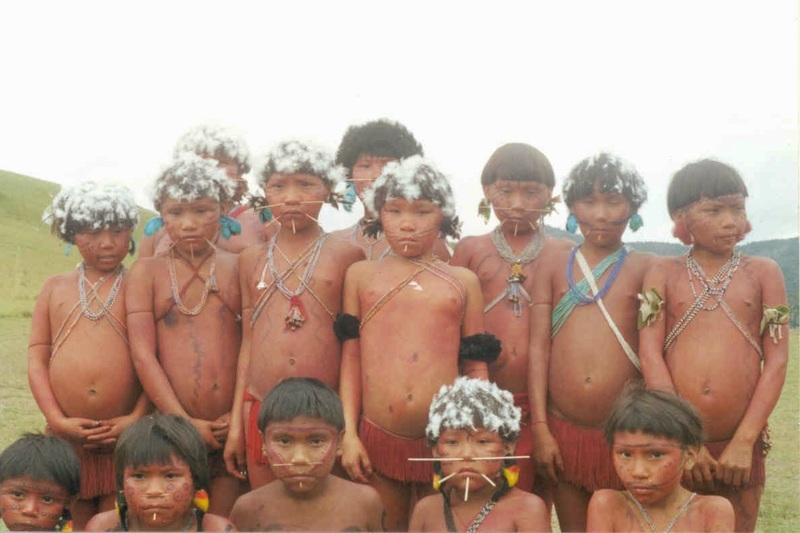 The point is that after Darkness appeared, Yanomami and various advocates and spokespersons demanded the return of the blood samples, which had become symbolic of the outside interference so resented by the tribe. This request for return has led to over ten years of interactions between us and the Brazilian government to find a way to ship the samples collected there back to them, safely, and free of legal entanglements about the samples and the work done in the tribal area. This was not contentious negotiation, just a matter of the complex logistics (including biosafety, getting samples to Amazonia) and technical (liability issues) things to work out. Well, finally, yesterday, the samples were shipped back to Brazil. I hope they arrive on location without incident, and that the Yanomami are pleased. We are relieved that at least this aspect of contention has passed. It won't change any feelings of having been taken advantage of, perhaps, but it may help show at least respect and good intentions. These samples were collected in complete compliance with the informed consent conditions of fifty years ago. But since various untoward things have happened to the Yanomami, what was at the time clearly a voluntary cooperation with the outside scientists (based on extensive filming), has been seen in retrospect as exploitive in various ways that include stimulating violence and even child sexual abuse. Exploitation by unrelated outsiders, such as mineral prospectors, has apparently caused much harm, and the Indians, searching for whatever redress they can obtain, see the continuing presence of the blood samples at various US institutions as symbolic of their sufferings. I was not involved in the collection of these bloods, and have never been to the Yanomami territory. So I cannot comment about those grievances. However, I was blamed for having the samples in my possession as caretaker and someone who could do further analysis of their genetics, as if guilty of the decades-earlier abuses simply by association with the blood samples. My only work at the time had been to analyze the Yanomami demographic data (after they were collected, when I was a post-doc) jointly with Jim Neel. But as caretaker of the samples I have been accused of nefarious acts, none of which I had committed. I'm glad those samples have been returned, in part because I hope it makes clear my good intentions, but also because, once requested, we had no right to retain them. This contentious affair raises many questions about informed consent. Above all, I think, is that informed consent never ends. Subjects have, and should have, the right to withdraw from a study at any time and for any expressed reason. Indeed, we have no right to ask for a reason. Being ticked off at the outside world is as good as just saying "Remove me from your study, please." One must recognize that when data about a sample have been published or melded into a large data base, or distributed anonymously and analyzed by various groups, turned into a patented product, or in other ways already analyzed, that such results cannot be un-published. This is probably particularly relevant to genetic studies because of their complex statistical analytic nature. But beyond that, rights should belong to the study subject, unless quid pro quo's and the like have been arranged at the time of collection, when conditions of participation and so on should be clearly settled at the time. Investigators often try by various subtleties to retain rights, or obtain consent, that one knows, realistically, are not understood adequately by the study subjects. Once DNA is in our hands, the temptation to study whatever becomes possible to study is hard to resist. After all, study subjects are not as a rule technically aware and/or the investigators have clear self-interest. Anyone who thinks informed consent is usually truly 'informed' is kidding him or herself. Even the investigators cannot know the benefits or risks that may be involved, because if they did the science would not be necessary. Subjects may be ill or even desperate patients seeking treatment, or subjects may be offered compensation for their participation. This doesn't mean there is any evil intent on either party's behalf. Vague promises of follow-up of various kinds are often made, sincerely or naively, but are often not kept or are conveniently interpreted by both parties. We know a lot more about informed consent now than in the 1960s, but still issues arise because both subject and investigator have clear self-interests but also because the science has become ever more complex. Decisions about restrictions and restraints seem, to me personally, too often to rest with the investigators, and the power is largely in their hands. Rationales for doing things in, say, other countries that can't be done here seem rather common. These have been difficult issues for many decades, especially after the eugenic era abuses. The issues are likely to remain challenging. There are no clear answers, but at least we think that withdrawal without needing to give a reason should always be allowed, unless the work has been done and makes it impossible, as noted earlier. But at least some contentious samples have been returned. It is no secret that universities are now operating on the 'business' model. This self-flattering term applies to all of their operations, not just their research component which has by now long been in bed with private interests and empire-building in regard to public funding sources. It also applies to athletics, which is nothing new, though seemingly more out of control than ever. Finally, it's swept like a pandemic across the academic sides of things as well. A good treatment of this, from the UK perspective, is an essay by Marina Warner, "Learning my Lesson: The Disfiguring of Higher Education", in the March 19, 2015 issue of the London Review of Books. She properly rakes the UK university system, which is much more centralized under government control than ours, over the coals. She identifies the various venal takeovers that have been occurring. These include the denigration and diminution of subjects that might enlighten people's personal lives but don't pay in hard cash (the humanities, arts, literature, and so on). Among much else, she notes the very fine buildings being erected on campuses, by prizewinning architects, largely for industry-related research. The priorities are clear and they're no secret. Faculty are being downgraded unless they're in the money subjects. Tenure and promotion are based on bean-counting 'objective', and hence essentially material, evaluation methods. Such numerology can be gamed, and is being gamed, such as by publishing more but more trivial papers, spending more of one's time writing grant applications, less attention to teaching, universities hiring low-paid Instructors to teach high-paying high-indebted students, while high-paid professors seek high-income grants. Meanwhile, even higher-paid administrations are becoming ever more bloated, administrators' salaries inflated with helium far exceeding those of actual professors. By now everyone knows what's going on. Administrators of course control the power leverage. They may delude themselves about how important and vital they are, and how their 'objective' performance standards maintain quality and all that sort of puffery. Of course, only in Lake Woebegone can everyone be above average (though all can claim to be). Administrators cannot be expected to curtail their own power and salaries, because if they did, most would have to return to the (ugh!) demeaning work of actually teaching classes. Warner's article is about the UK, but in the US we have these problems in spades and here, too, everybody knows it. Indeed, it was Reagan, and the ensuing Reagan-Thatcher conspiracy against ordinary people, by which this whole process was initiated. Much of the rest of Europe is following suit (we don't know whether universities in Asia, Africa, or the rest of the Americas still have their pants on or are dropping them for money as is happing in the European-US axis). The US has worse issues that it is conveniently not doing anything serious about. Europe doesn't have the Greek (fraternity and sorority) system. Europe doesn't have the athletics problem. A recent graphic making the rounds of the internet showed the highest-paid state employees in the US states, and 40 were university coaches with outrageous salaries. Europe doesn't (yet) have the fancy-dorms-with-luxury-spas system we are building, which venally corrupt the idea of a serious-level education. Why this (given its huge cost and the student-debt problem) doesn't disgust parents and lead them to insist that their kids go to more cost-conscious and educationally serious schools instead is unclear. Maybe a spate of OpEd articles will lead them to that, and perhaps force universities to scale back their excesses. That all that glitters, staggers, and cheers appeals to 18 year-old high-schoolers looking for a college is easy to understand, but puts the blame on the adults who lure them, and their high tuition, to their campuses. What's the justification? "Everybody else is doing it and if we don't do it we'll lose these students!" Of course, we here at the universities are the profiteers, because the students bear the debt burden, often for decades after graduation....er, that is, whether with a degree or not when they leave, while we take home our nice paychecks. Just because it's in our own backyard? We ourselves have had academic careers, and anyone knows best the dirty laundry in their own backyard. There is a tendency, especially if one cares about that backyard, to be excessively critical of it. In our case, Penn State, where we have been for almost 30 years, is a fine example of the not-so-fine state of affairs. But while we do criticize our own institution, we do our best to take into account that it's the one we care most about. Here were and are our fine colleagues and many wonderful students (including two of our own children). Bloated though bureaucracies may be, including university administrations, this doesn't mean the people are individually bad or not helpful, and we've admired and been helped by many across the years. But the above burdens have grown here, as elsewhere, and it is fair game to note that. We here are not unique; indeed, if anything has bothered us it is that Penn State has not taken leadership in addressing the issues in more than a me-too fashion. Worse, in our particular case, the Sandusky child-abuse scandal gave Penn State a huge silver platter on which to do real reforms, curbing athletics' over-reach and reestablishing serious academic standards; indeed, it's what our then-President promised we would do in response to Sandusky: rebalance 'academics' and athletics. But what happened since was nothing of this sort, and the old ways are in full stride, and academic standards have not been raised. We repeat that this is not just a local problem: it is widely and often recognized as a national one. The problems are not unknown and indeed are widely written about. Universities, being good, well-behaved bureaucracies, usually respond by acknowledging problems and setting up a committee or 'task force'. That meets for a year or more and issues a report that claims major changes but is usually little more than safe rearranging of the deck chairs. We need to stimulate industry-related research? Build a building and call it Novelty Central, accessed via Creativity Road. You likely know what we're describing. Warner's article should be read by anyone who cares about the state of educational affairs and would like to know more about what is going on--hopefully to be made angry enough to join in the effort to do something about it. Reform will be very difficult because there are too many prima donnas too well entrenched to be dislodged without a struggle. But if there is no struggle, reform will come after we have fallen so far that serious consequences become palpable. Of course, we could just be reactionaries, objecting nostalgically to changes that make universities unlike what we ourselves have known. If this were not clearly a national problem on three major fronts, that might be the case. We don't think it's reactionary to object to the luxurious life for students (and faculty) on campus at the clearly exploitive expense of heavily indebtedness is a reactionary position. The national downward trend in our educational attainment relative to competing countries elsewhere is a legitimate reason to call for reform. The edifying value of education for its own sake and to engender better citizenship, and the value of disinterested research (publicly open and not done for private gain) are well-established reasons to have a bastion of independent thinking as part of our national resource. Whatever happens with online and other new-mode courses may or may not be good, but doesn't directly address the issues of (1) the national value-added gain of subsidizing education, (2) the value of independent knowledge, and (3) the motivation of an idealistic and dedicated faculty to live a modest but comfortable life rather than chasing personal wealth which, after all, they are free to do in the private sector. Is it fair to title this post as we did? Regardless of how tolerant you are of the changes, the days of the elbow-patched tweed jacket seem to be over. But that change has left other holes in our educational culture that badly need to be patched.